PHProxy theme from FreeProxyTemplates.com. Described as Proxy Template #1. Click Here to learn more about this PHProxy theme and template. This proxy theme was downloaded over 3,000 times when we visited this PHProxy template download page. This site was made to become proxy theme resource. 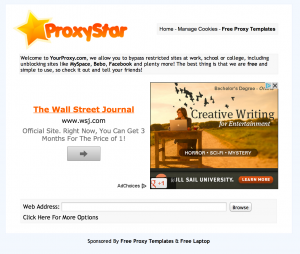 I hope to list websites where you can download proxy themes. Wether you use Zelune proxy, CGI proxy, and PHP proxies I hope to have links to these types of proxy templates and themes.